She Who Watches, whose Native name is Tsagaglal, is an image created in stone. Unlike most of the rock images found in the region, which are either rock etchings (petroglyphs) or rock paintings (pictographs), She Who Watches is both. She Who Watches sits high up on a bluff, overlooking the village of Wishxam, the village where Lillian Pitt’s great-grandmother used to live. She Who Watches was the first rock image that Lillian ever saw or knew anything about, and it was only because an elder took her to see it. The elder thought it would be good for Lillian to learn something of her heritage and of her grandmother’s village. 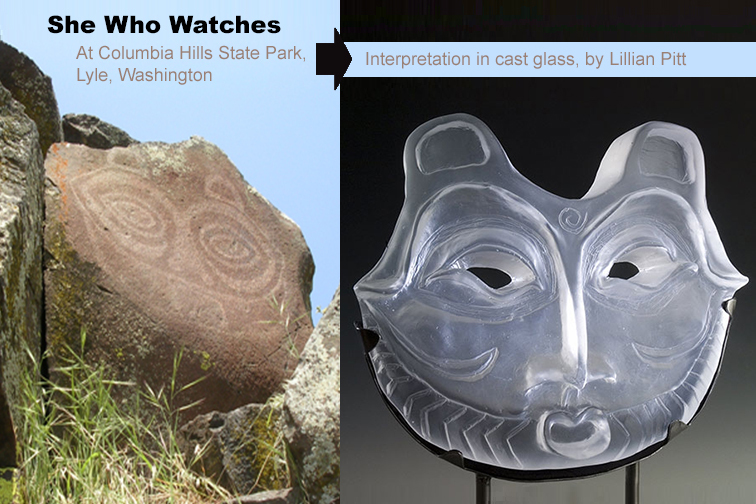 She Who Watches and other rock images can be viewed by special arrangement at Columbia Hills State Park, which is located off Hwy 14 between Lyle and Maryhill. Please stay on the trails and do not touch any of the images. Please, at all times, show proper respect for the images, not just because they offer an amazing glimpse into the history of the region, but because many Native people feel they are sacred. Are Archeologists Scholars or Thieves?